On Friday, June 15th, 2018, CMG Innovation held its Bi-Annual Safety Meeting for all employees. Topics discussed included Hazard Identification, Risk Assessment, Housekeeping, Team Work and a review of the importance of required paperwork; including Hot Work Permits, Heavy Equipment Pre-Use Inspections and Daily Pre-Task planning. The importance of Pre-Task Planning was highlighted by looking at the most recent statistics of workplace injuries and fatalities within the construction industry as well as case specific accidents which could have been prevented. 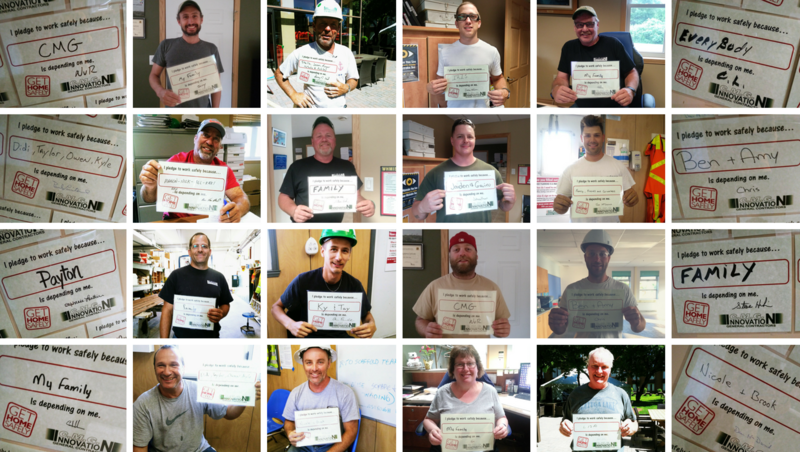 Pictured here are our employees with their pledges to work safely for their family members and loved ones who are depending on them. CMG would like to thank all of our employees for their contributions to the Health & safety of everyone within the company. Kerry is CMG's Human Resources Administrator and Health & Safety Officer. She is responsible for CMG's Bi-Annual safety meetings and on site safety training. She is a proud alumni of Carleton University.